One Key World is running a promotional draw with the grand prize being a round of golf with PGA Tour star, Jim Furyk. Celebrity endorsement and promotions are certainly starting to catch on in the world of luxury vacation clubs and destination clubs. Ultimate Escapes made the most of their member Doc Rivers NBA championship win last month. In addition, the clubs frequently offer other promotions and incentives for people joining their clubs. We report on the incentives as a way to keep potential members up to date on the offers  do sign up for the SherpaReport newsletter if you would like to be kept up to date on these offers and other news about the clubs. 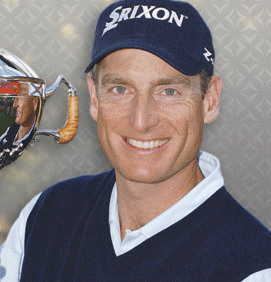 Jim Furyk has been a member at One Key since 2006 and has enjoyed several vacations with them. The longtime worlds number #2 ranked golfer, Furyk has been in the top-10 world rankings for 250 weeks since 1999. The grand prize for this draw is for one winner and two of their guests to play a round of golf with, Jim Furyk, at the site of the Players Championship, The TPC at Sawgrass in Jacksonville, Florida. A one year "10 Tee Unit" Tour GCX membership. A three day pass to the classiccarclub which entitles the winner to drive his/her choice of a F430 Ferrari or Lamborghini Gallardo. Framed pictures of Olympia Fields North autographed by Jim Furyk, and the site of his 2003 U.S. Open win. This current promotion is different to many destination club promotions in that you dont have to join the club to enter the draw. You simple sign up at the One Key website. One Key has a rather unique model with its prepaid travel card for vacations at luxury homes and villas around the world. The club offers 400 homes in 30 destinations and has three card options with 15, 25 or 45 nights of travel. While One Key doesnt own these homes it has inspected them to ensure they meet its standards, and it also provides full concierge and travel planning services. Other destination clubs tend to own all or most of their homes, and members of these clubs pay a one off membership fee and then annual dues that vary depending on their preferred number of days of travel. The clubs also provide complete travel planning and concierge services.